After taking my chicken with a broken leg to the vet when I was very young, I knew I wanted to work with animals. I have a passion and admiration for nature and the conservation of species. 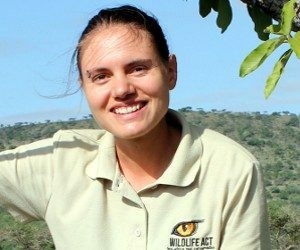 After graduating from the University of Pretoria with a Masters degree in Wildlife Management – specifically carnivore conservation, I am eager to be out in the field and put my years of studying into action. I have lived overseas and in four of South Africa’s provinces and have been privileged to experience many of the unique reserves and wilderness areas which South Africa and its bordering countries have to offer. I always dreamt about living and working in one of these areas. Working for Wildlife ACT in the beautiful Kwa-Zulu Natal reserves fulfills this dream. Although we humans are only a small part of the earth’s ecosystem, we have an important role to play. Being involved in conserving some of Africa’s most threatened species brings me great joy and a sense of accomplishment.